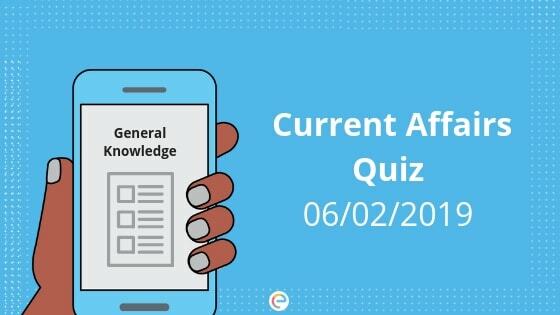 Current Affairs Quiz for February 6, 2019: This section covers the GK and Current Affairs quiz with daily MCQs on National Affairs, International Affairs, Economy, Banking Affairs, Polity, Geography, Environment, Sports etc. for competitive examinations viz. UPSC, SSC, Bank PO, Bank Clerk, IBPS, Railways, Government Jobs, UPPSC, MPSC, and other state exams. This current affairs quiz will help you in General Awareness section conducted in various Banking, SSC, Insurance, Railways, and other govt job entrance exams. Current affairs quiz will also help you outshine in the crowd with all the information you gain from this article. 1. Where was the 4th edition of the international spice conference held? Explanation: The fourth edition is planned in the CITY OF PEARLS, Hyderabad; the capital of Telangana, India. The theme for the conference is ‘Challenges of Change, Redefining the Value Chain’. The International Spice Conference provides a platform to all stakeholders of the industry including the business houses, the spice associations, the policymakers, the farmers and the end users, to address and interact. 2. Which state government entered into a pact with Microsoft to improve the education system in the state by boosting digital literacy? Explanation: Microsoft India entered into a pact with the Sikkim government to improve the education system in the state by boosting digital literacy and the knowledge of new-age technology among students and teachers in government schools. Explanation: Pakistan Army successfully test-fired the short range surface to a surface ballistic missile “Nasr” which it claimed can defeat any ballistic missile defense system now available in the country’s neighborhood or any other system being developed. 4. Where was the second phase of Pasupu-Kumkuma(Turmeric Kumkum) scheme launched? Explanation: Andhra Pradesh Chief Minister N Chandrababu Naidu launched the second phase of Pasupu-Kumkuma(Turmeric Kumkum) scheme and welfare pensions. Under the second phase of the scheme, women who are a part of Development of Women and Children in Rural Areas (DWCRA) will be given Rs 10,000 in three instalments.Rs 9400 crore have been granted for the scheme. 5. Indus River Dolphin is declared as which state’s Aquatic animal? Explanation: One of the world’s rarest mammals, Indus River Dolphins has received an exceptional distinction. Found only in India and Pakistan in the Beas River, the generally playful Indus Dolphins have been declared Punjab State Aquatic animal. 6. Which authority has advised the banks to waive off the processing, documentation, inspection, and ledger folio charges for the Kisan Credit Card Scheme? Explanation: The Indian Banking Association (IBA) on February 4, 2019 issued advisory guidelines requesting banks to waive off the processing, documentation, inspection, ledger folio charges and all other service charges for crop loans up to Rs 3 Lakhs or for the Kisan Credit Card Scheme. 7. The first ever Human Space Flight Centre for Gaganyaan mission is set up in which city? Explanation: The Indian Space Research Organisation (ISRO) on January 31, 2019, unveiled its Human Space Flight Centre (HSFC) at ISRO Headquarter campus in Bengaluru, Karnataka for its maiden manned space mission ‘Gaganyaan’. The space center shall be responsible for implementation of Gaganyaan project which involves end-to-end mission planning. 8. Which two e-com giants lost a market capitalization of USD 50 billion on February 1, 2019, after the new FDI norms for the e-commerce sector came into effect in India? Explanation: As the shares of Amazon and Walmart lost 5 percent and 2 percent, respectively, both the companies together lost a market capitalization of USD 50 billion on February 1, 2019. The fall in stock prices can be attributed to the disruption caused in their e-commerce operations in India after the introduction of the new Foreign Direct Investment (FDI) norms for the e-commerce sector came into effect. 9. Which country recently celebrated its 71st Independence Day? Explanation: Sri Lanka celebrated its 71st Independence Day on February 4, 2019, in Colombo. Maldives President Ibrahim Mohamed Solih was the guest of honor at the main function held in Colombo. The three branches of military performed an impressive parade along with a display of defense equipment while artists and students showcased the major dance forms of the country including Kandyan and Bharatnatyam. 10. ______ pardoned around 50,000 convicts on its 40th revolution anniversary. Explanation: The Iranian Judiciary Chief Amoli Larijani announced on February 4, 2019 that 50,000 convicts will receive pardons from Leader Ayatollah Khamenei on the occasion of the 40th anniversary of Iran’s 1979 Islamic Revolution. 11. The CEA committee is made to explore prepaid payments by state electricity distribution companies to power plants. What is “A” in CEA? Explanation: The government has constituted a committee under the Central Electricity Authority(CEA) to explore prepaid payments by state electricity distribution companies to power plants. It was recommended by a panel of PK Sinha. 12. State-owned NBCC is going to construct an Ayurveda and naturopathy hospital. Which state is hosting it? Explanation: State-owned NBCC said it will construct an Ayurveda and naturopathy hospital in Goa at a cost of Rs 267.81 crore. A memorandum of understanding with the Ministry of AYUSH has been signed in this regard. 13. The 20 years Kala Ghoda Art Festival happened in which city? Explanation: The Kala Ghoda Art Festival began at the iconic Kala Ghoda Precinct in South Mumbai. Kala Ghoda Association was formed on 30th October 1998 with the object of maintaining and preserving the heritage and art district of South Mumbai. Explanation: Qatar won its first major soccer title by beating four-time champion Japan 3-1 in the Asian Cup Final, completing an improbable run to glory for the Gulf nation as it prepares to host the 2022 World Cup. 15. What is the theme of World Wetlands Day this year? Explanation: World Wetlands Day is celebrated every year on 2nd February. The theme of this years is “Wetlands and Climate Change”. It has been chosen to initiate action against the drainage of wetlands. Each year a theme is selected to focus attention and help raise public awareness about the value of wetlands.